The Nashville Predators general manager is the headliner for the 2018 class of the U.S. Hockey Hall of Fame. Former University of Michigan coach Red Berenson, three-time Olympic medalist Natalie Darwitz, retired NHL referee Paul Stewart, Poile and the late Leland “Hago” Harrington will be inducted on Dec. 12 at a ceremony in Nashville, Tennessee. Poile has run an NHL team the past 36 seasons, including 15 with the Washington Capitals and 21 with the Predators. He has the most victories of any GM in league history. 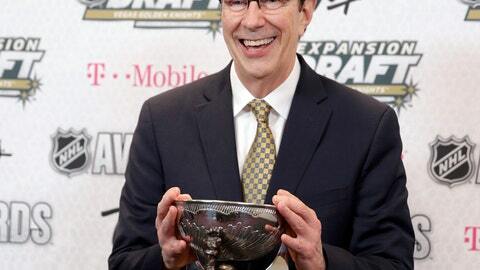 The U.S. won a silver medal at the 2010 Olympics with Poile as assistant GM, and he was GM of the 2014 Olympic team. And the 68-year-old isn’t done yet. He knows expansion is in the NHL’s future, brought up the possibility of a future division in Europe and added he’d like to continue to be a part of USA Hockey in the years to come. Poile and Berenson were born in Canada and went on to make significant impacts on hockey in the United States. Berenson coached Michigan for 33 seasons, taking the Wolverines the NCAA Tournament 22 straight times and reaching the Frozen Four 11 times. Darwitz was the youngest player on the U.S. national women’s team at 15 in 1999 and won three Olympic silver medals. She set the career scoring record at Minnesota (246 points) and the single-season NCAA record. Stewart officiated 1,059 NHL regular-season and playoff games. He’s the only American to play and referee in the NHL. Harrington was the first American-developed player to record a hat trick and skated in 66 NHL games. He died in 1959.